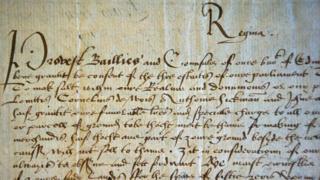 A group of documents believed to have been signed by Mary Queen of Scots have come to light at the Museum of Edinburgh after decades spent unseen. Files showed they were gifted in 1920 but they had been lost in storage until recent inventory work by curators. The handwritten documents are said to provide a "fascinating insight" into commercial life in Edinburgh in the 16th Century. They can be viewed online and will hopefully go on display in future. For the time being, the documents will remain in safe storage at the Museum of Edinburgh because of their fragile state. Future plans are to have them assessed by a conservator and for further research to be done on them by experts on Mary's reign, after which the hope is to exhibit them for residents and visitors to enjoy. Meanwhile, the new discovery can be viewed online. Who is Mary, Queen of Scots? Mary is one of the most fascinating figures in Scottish history. She was born at Linlithgow Palace in 1542 and became queen when her father died soon after her birth. However, Mary was taken to France in 1548 and Scotland was ruled by regents. She returned in 1561 to begin her reign as Queen of Scots but was forced to abdicate at the age of 24 after six tumultuous years. After an unsuccessful attempt to regain the throne, Mary fled to England seeking the protection of her cousin . Mary had once claimed Elizabeth's throne as her own and was considered the legitimate sovereign by many English Catholics. The Scots queen was held in captivity for 18 years before she was executed at Fotheringhay Castle in 1587, at the age of 44. Her son James became king of Scotland and England. Donald Wilson, culture and communities convener at City of Edinburgh Council, said: "Museum and Galleries Edinburgh hold thousands of historic treasures on behalf of the city and its visitors, many of which are on display in our venues. "However, some items, such as these documents, are too fragile to be on long-term display, so putting them online is a great way to showcase them and tell their stories." The museum's history curator Vicky Garrington said the documents provided an "amazing bridge to the past". "It's incredible to think of Mary Queen of Scots reading through these documents before carefully applying her signature," she said. "We all know the story of Scotland's Queen, her eventful life and eventual execution, but in these documents, we see a different side to Mary. "Here, she can be seen carefully managing the everyday affairs of Edinburgh and Scotland. These documents help us to better understand her reign." Frank Little of Museums and Galleries Edinburgh said they hoped the ongoing inventory work would continue to turn up "new treasures". "We are constantly reviewing, caring for and researching our collections, and look forward to sharing more of the city's rich heritage with residents and visitors through our programme of exhibitions and online activities," he said.